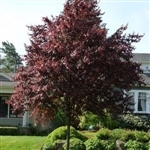 Accentuate the beauty of yards and property with our selection of gorgeous flowering trees of many varieties. We offer dogwoods, peach, pear, cherry blossom trees, mountain laurel, Vitex, althea, and crabapple varieties to name a few. The bright and lively colors of our red or pink blossom trees combined with our white flowering trees are sure to add an attractive splash of the rainbow to all areas. Our flowering trees are shipped through USPS primarily on Mondays, Tuesdays and Wednesdays with occasional shipments on Saturdays. Plants will be sent bare root, wrapped in wet sphagnum moss and in a plastic bag secured with tape. When your plants arrive, be sure to soak them in water overnight, then plant. Please review all shipping procedures and conditions on our Shipping & Returns pages. Call 409-381-0128 for information regarding our products, including care, maintenance and upkeep! Shop for beautiful, flowering trees grown in the USA with Talbott Nursery! DELIVERY FROM NOW TILL SOLD OUT!!! 7-Gal plants are too large to be shipped via USPS....must be picked up at the Nursery.